Wowza! Make that special someone's mouth water by sending the Classic Cookie and Brownie Tower. Thoughtfully designed with those with a sweet tooth in mind, this gift box features all sorts of decadent treats. If that wasn't enough, these goodies are hand-decorated, meaning no two gifts will be exactly the same! ALLERGEN ALERT: Product contains: egg, milk, soy, wheat, peanuts, tree nuts and coconut. We recommend that those with food related allergies take the necessary precautions. 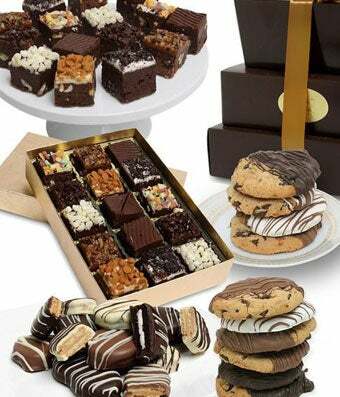 Our collection of chocolate covered products are available for next day gift delivery. Place gift orders online prior to 3pm for guaranteed overnight delivery or select a future delivery date. Cutoff delivery times may change during the holidays. For same day delivery please click here for Same Day Flower Delivery. Delivery is available Tuesday through Saturday every week excluding some major holidays. Please note that chocolate contains milk and soy. This product is made in a facility that manufactures products containing one or more of the following ingredients: peanuts, tree nuts, soybeans milk, eggs and wheat.